When the time comes for you to use your awesome skills, will you? Putting a Homo sapien on a motorcycle is just asking for trouble. You simply can’t escape the fact that we are all prone to doing really dumb things. Don’t bother denying it. You’re human and humans are fallible. I believe that well-developed physical skills and sharp mental skills allow you to ride with more control and increase safety. But, is it enough to simply know these skills? There has been a great expansion of motorcycle training programs in the U.S over the last 20 years. So why has the fatality and injury rates on America’s roadways have actually increased? Whaaaaa? One problem is that “well trained” riders often fail to execute the very skills they mastered in the parking lot. It’s one thing to know how to master swerving or emergency braking, but it turns out that it’s quite another thing to actually apply these skills in the heat of battle, like when a car darts out in front of you at an intersection. Is this good enough to train for real life? During MSF courses, students are asked to practice emergency stops by applying the brakes when their front tire reaches a set of cones. Once the technique is practiced a bit, instructors step in the path of travel, throwing their arms up to simulate the need for an emergency stop in an attempt to make the drill more realistic. Even though students experience more stress when the instructor is standing in the way, this trigger is not nearly stressful enough to emulate what happens when an actual two-ton vehicle suddenly appears in your path. Practicing emergency braking is critical. But,so is visualization. Soldiers, pilots, police officers, firefighters, and other people exposed to high stress situations are trained using methods that emulate the real-world so they can handle the inevitable first battle, conflict, or emergency situation. Without this part of the training process, the skills are likely to either become too delayed or go unused as the brain wastes valuable time processing what is happening. The training includes sounds, smells, and sights that shock the ears, nose, and eyes. Explosions, live ammo, alarms, and life threatening scenarios played by actors all prepare these trainees for the worst. That doesn’t happen with motorcycle training. Nobody dares to suggest that instructors drive a Chevy onto the practice range at random times or walk unpredictably in front of unsuspecting students, or secretly drop sand or diesel fuel on the parking lot. These scenarios would help condition students for real-world situations, but liability means this method just won’t fly. The next best thing to exposing riders to real-word scenarios is visualization. Racers use visualization to run laps in their mind before hitting the track. They can be seen closing their eyes or staring into space as they imagine every nuance of the racetrack and every braking, shifting and cornering action with great precision. Click a stopwatch as they begin and end a visualized lap and the best racers will be remarkably close to their real lap times. This exercise is known to be almost as effective as actually riding the machine on the track without using tires or fuel, or risking a crash. Street riders can also use visualization to train themselves to manage a car pulling out from a side street or a patch of sand appearing suddenly around a blind corner. The MSF attempts to have new riders visualize real life hazards using videos and online simulators. But, I believe visualization can be more effective, if riders are taught how to do it. Close your eyes and visualize yourself riding to work. As you enter a familiar intersection, imagine a car suddenly running the stoplight or stop sign. Feel the panic as your muscles tense and your eyes widen. Now, imagine yourself squeezing the brakes fully, the G-forces pushing you forward to the extreme. Did you avoid a collision? If not, then try again. And again. You cannot do this too much. Go back in time and plan better by slowing down and covering your brakes to reduce reaction time. Notice how much more time you gave yourself to respond. To avoid target fixation, imagine looking away from the car and toward an escape route. Good job. Replay different outcomes and solutions. Imagine yourself swerving instead of stopping. Next, visualize other scenarios, like rounding a blind corner and needing to avoid an animal, or realizing the the corner is tightening and your speed is too fast. This training is not the same as having a car pull out in front of you, but it can be remarkably effective if done well…and it’s safe. 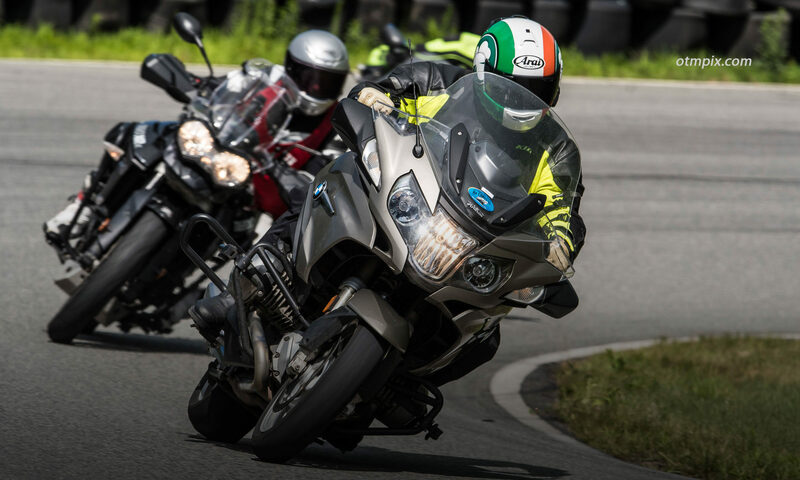 Learning advanced braking and cornering skills and strategies for surviving will most assuredly increase your chances of making it home in one piece. But, it has now become apparent that this is simply not enough. Sit down and visualize yourself successfully managing some very scary hazards so you are better prepared for the inevitable conflict. It could happen tomorrow, so don’t delay. The white pick-up in the photo looks suspiciously like the one that pulled out in front of me on Rt. 202 north in New Salem last week. I braked, but nicked his rear bumper and broke my left-front turn signal. I think it could have been worse, but thanks in part to MSF advanced training and ABS, I avoided a close encounter with the truck-bed. However, I do replay the close call and wonder what I could have done differently, e.g. countersteer hard or slowed earlier. You have probably written about this prior, but what might occur when hard braking and countersteering are simultaneously employed? Those pesky white trucks. I’m glad you and your bike are okay. I have written plenty about the problems with simultaneous braking and swerving in MCN, but I have not yet written an article for the blog. I will make sure to put that on my list. “You may think that applying the brakes and swerving at the same time is a possible option. But, this increases the possibility of losing traction and “tucking” the front tire. You can get away with using some brake force while swerving, but it’s usually better to separate the two.